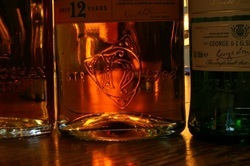 Stroud Whisky Club was founded in Gloucestershire in 2013. The goal was simple, to provide an easy going, fun, and social environment where our members can meet to try and discuss a variety of Whiskies. We meet once a month and are always looking for new visitors and members. If you enjoy Whisky and would like try a variety of bottles not only from Scotland but from all over the world then you should consider coming to visit us. We are an independent club that meet at The Ram Inn (South Woodchester, Gloucestershire) and there is a standard meeting fee of £17 per night. This will include the Whisky, water and some light snacks. You must be over 18 years old to attend or join. The Ram Inn is the ideal place for us to host our meetings as it is in a beautiful local, has excellent facilities, ample parking and 2 wonderful beer (Whisky) gardens. They offer an excellent menu and there will be a break during the evening where you can order food should you wish to. We do not recommend drinking on an empty stomach. So far we have sampled over 100 different bottles of Whisky and Whiskey from over twenty countries and this number grows every month. Our aim is to try not only Scottish Single Malts but also Whisky and Whiskey from around the world. So far we have tried Whisky from Scotland, England, Ireland, Sweden, India, Taiwan, South Africa, Japan, France, Wales, Northern Ireland, Holland, Australia, Switzerland, Finland, Iceland, Japan, Germany, Canada and America. Look at our events page for details of what's on in Gloucestershire. If you are based in Gloucestershire and are interested in Whisky, why not come along and see for yourself. If you are on Facebook why not visit us there and "Like" us. You can also check out our Facebook for more information.